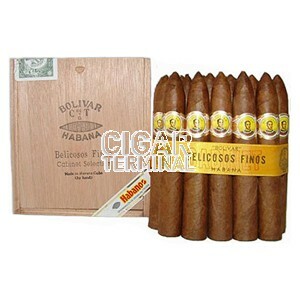 The Bolivar Belicosos Finos is a delicious full-bodied Campana, 5.5” (140mm) long, of 52 ring gauge, and comes in sliding lid box of 25 cigars. After the Royal Corona and the Petit Corona, the Belicosos Finos is one of the most popular cigars out of Bolivar’s factory. It is mostly due to its medium size and shape, and the fact that its flavors are regular and stand out among other Habanos that it is a top seller. 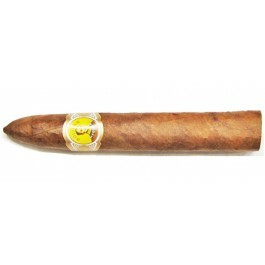 Its bold aromas and its full body make it a wonderful cigar to enjoy after an opulent meal. The Belicosos Finos is easily recognizable with its foot consisting of the pointy of a pyramid and its big ring gauge, similar to a robusto. A Pre-1960 release.